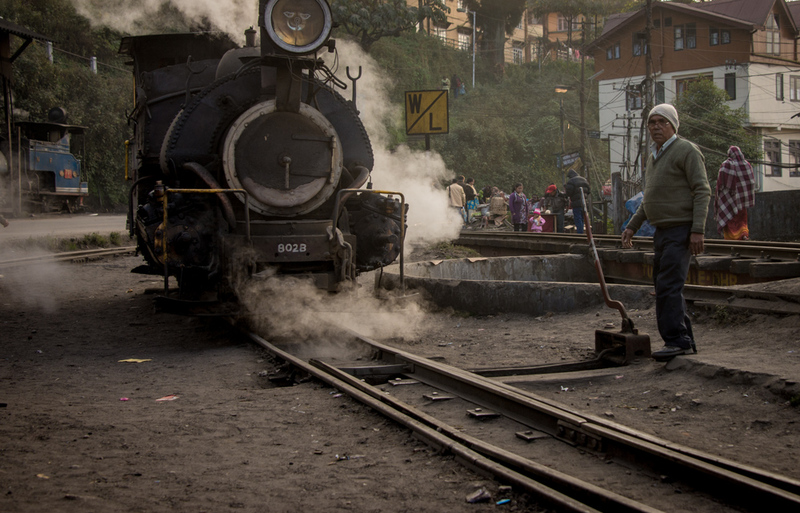 Darjeeling is home to the famed Toy Train or more accurately, The Darjeeling Himalaya Railway (DHR). This fascinating train is little changed from when it was originally created in the late 1800's. Confusingly, there are two trains that run on the line that extends from New Jalipuguri in the south to Darjeeling in the north. 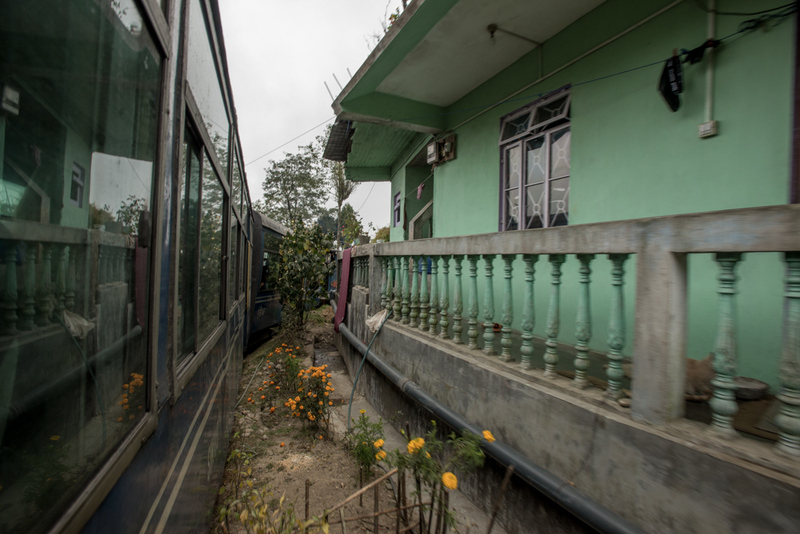 The first is a diesel powered commuter train that runs the whole distance (or rather, it did, the line has been closed south of Kurseong for some years due to a land slide). 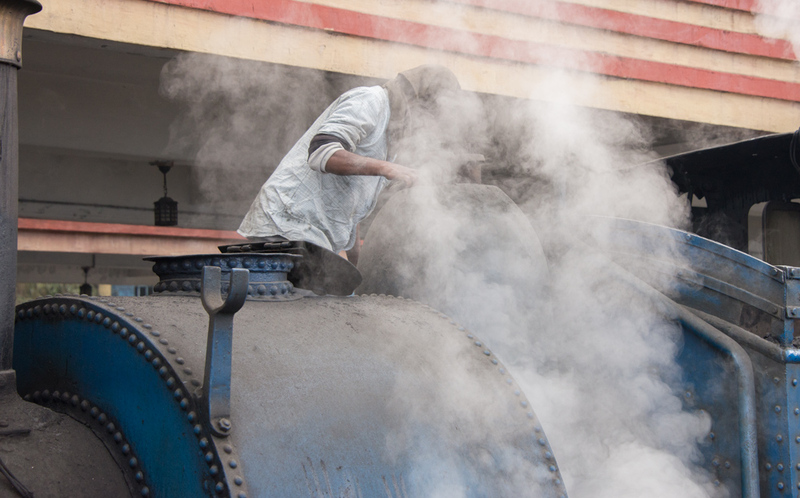 The second is a steam powered train that runs back and forth from Darjeeling to Ghum, several times a day. What makes a trip on this train so interesting is that for most of the journey, it rumbles along the old Hill Cart Road, sometimes only inches from buildings on one side and passing traffic on the other. 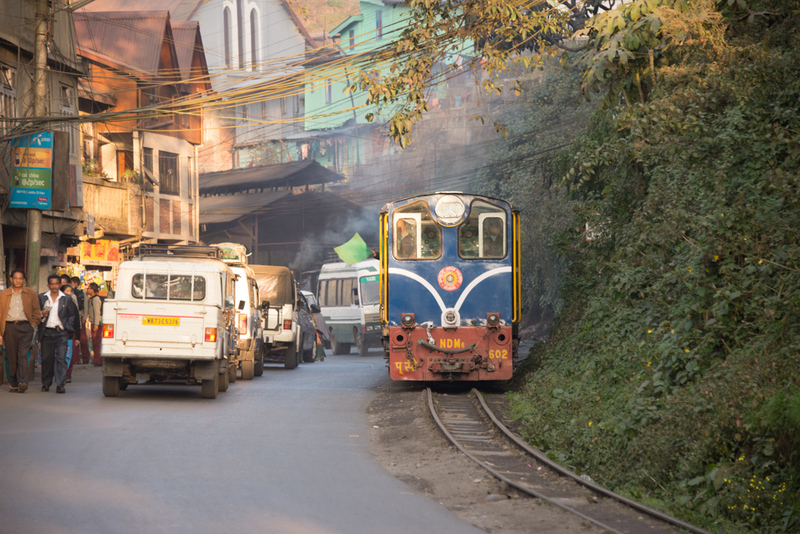 Originally built by the British, to transport tea and other goods from the hill station of Darjeeling, the railway was an incredible feat of engineering. The narrow gauge track of only 2 feet was carved out of the hilly terrain and included multiple loops and switch backs. It has hardly changed to this day. The service is maintained by a dedicated workforce who run and maintain the antique trains and track. The original line was opened in 1881 and the lineclimbs from NJP, at around 100 metres, up to Darjeeling at around 2,200 metres. The section from Ghum, is the most spectacular. The train blows its whistle almost constantly, in an attempt to give itself a clear run among all the obstacles. There are also some fantastic views across the lower Himalayas en route. Besides a stop for water, shortly after leaving Darjeeling, the train also takes a rest at the Batasia loop, around half way. This has a well manicured garden and great views. Price for the train cost 270 rupees for a return trip Darjeeling - Ghum. Tickets are available at the station in Darjeeling but it's advisable to book a few days in advance as there are only two carriages and they are often full. The ride is popular with Indian tourists as well as foreigners. A round trip takes around four hours. Just be careful not to confuse this train with the regular diesel service. As fun as that is, it's not quite in the same league as sitting behind a puffing and panting Victorian steam engine rattling along the road at what feels like a break neck pace. The engine driver and his accomplices are forever making adjustments and twiddling with levers and taps. There seems to be a long and well rehearsed ritual to coax the engine in to the right mood for its job. 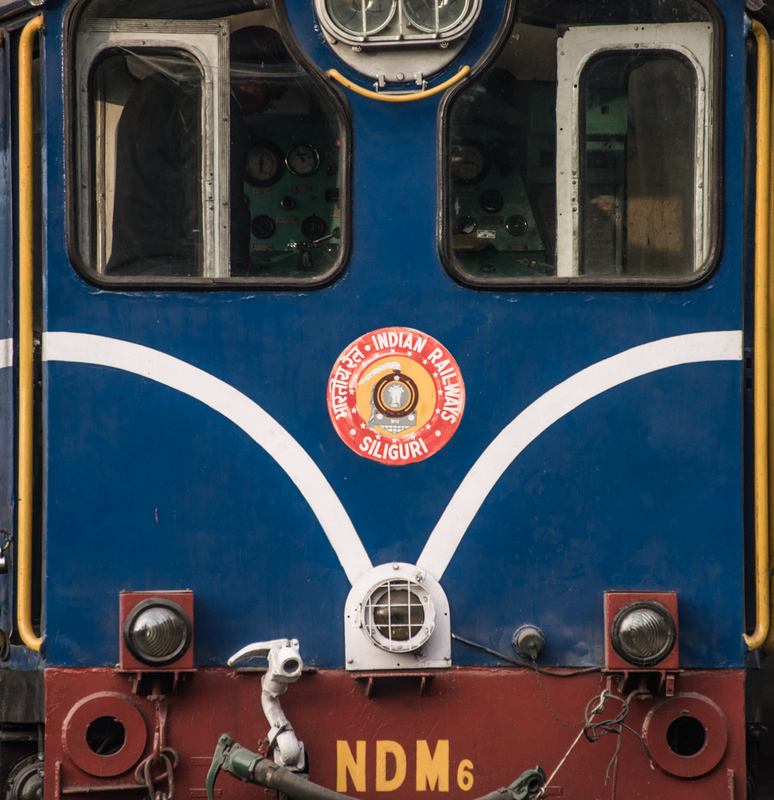 When it pulls out of the station at Darjeeling and crosses the road to the other side, it starts making so much noise it feels more like sitting in a dragon than in small train. Nevertheless, in true Indian fashion, it somehow makes its way along and after a while you stop holding your breath every time the engine scrapes by a car, or house, or pedestrian. It's huge fun and I hope it continues running for another 130+ years. Keeping the fire stoked. There always seems as though there is something to do to keep a steam train running! 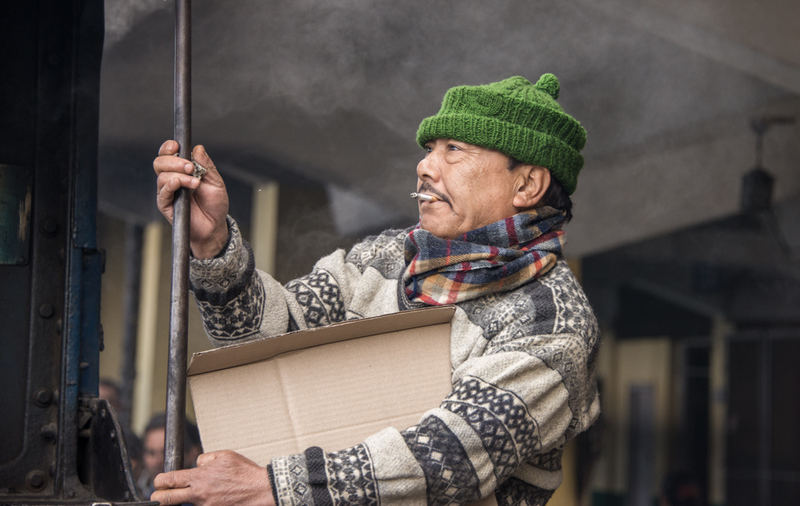 Finally, if you do make it here and decide to have a ride, make sure you allow enough time to get a cup of tea from the tea stall at Darjeeling station. It's the best you can find and perfect for fending off the chilly high altitude air. If you think of India, and your British, one thing that will spring to mind is Tea. In particular, Darjeeling tea. 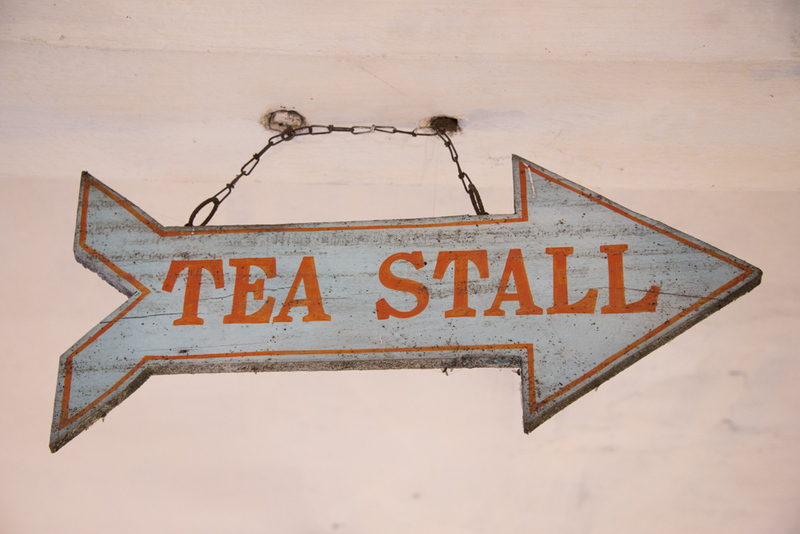 We drink oceans of the stuff in Britain and just about everyone will have heard of Darjeeling tea. While in India, I went to a plantation, and spent a few nights in a home stay with the workers to find out what goes on and how tea is produced. Lady working in tea plantation in India. The growing and harvesting of tea is one of the few crops that still has to be done manually. The terrain is often tough and the plants are close together but it's the skill needed for picking that means it has be done by the human hand. It's tough work! Typical pay is 90 rupees per day (just under $2) with bonus for picking over 8kgs in a day. Besides picking, there are other jobs that have to be done year round like pruning which is done after the end of the picking season. Men sharpen the knives used for pruning in the tea plantation. The grinding wheel is driven by pulling back and forth on a rope wrapped around a drive spindle. Once the leaves are picked, they are carried to the local processing factory. 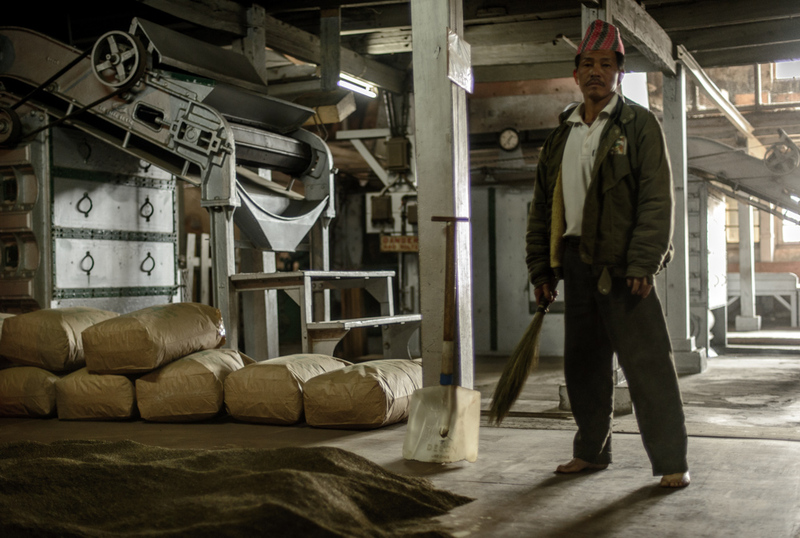 Here they go through a process of drying, sorting, shredding and roasting before the final product is produced. The processes seem to be intricate and are borne out of many years of experience in making tea. On the Makaibari tea estate, where I was, they produce a variety of different teas that vary in quality and taste. The shop foreman watches over the latest crop of finished tea. The workers live in local villages that are part of the estate and it struck me that they didn't seem to have much room, as their neat and tidy houses all had small rooms. However, the living standards seem good compared to regional equivalents. There is no doubt the work is hard. 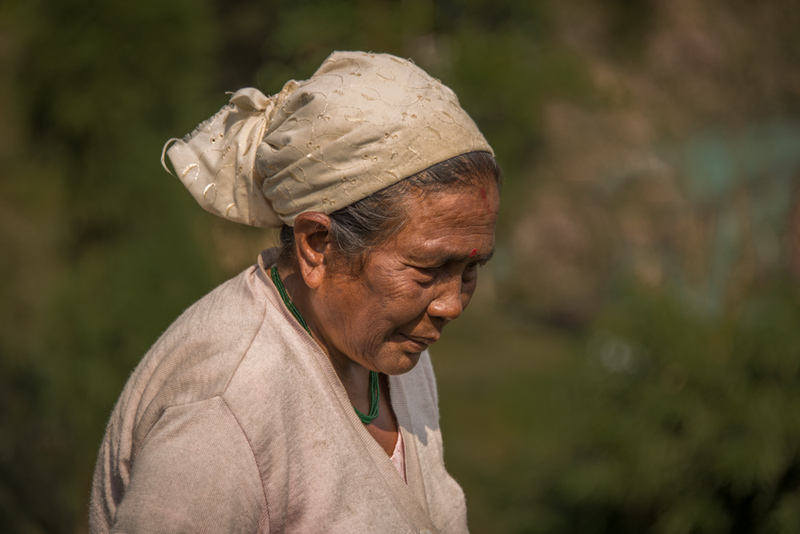 I struggled to get up and down the plantation carrying my backpack and yet the ladies working the fields carried baskets supported with a strap around their foreheads. I tried it, much to the amusement of the other workers, and managed to carry the basket well enough but it was empty! I think if it was full, I would have just fallen over backwards. Tea pickers of makaibari tea estate. The ladies were friendly and seemed to enjoy the diversion of being photographed, although they were initially shy to pose. This is the mother of the household that I spent three nights staying at. She was up at 5am and worked until past 8pm. I also got to meet Mr Banerjee, the third generation owner of the estate. He's an amusing and eccentric character with an impeccable English Oxford accent. His conversation switched from tiger hunting, to global climate change, to the price of a hotel room in Paris, with barely a pause. I got the impression that he cared about his responsibility not just to the estate but to the welfare of the workers too. 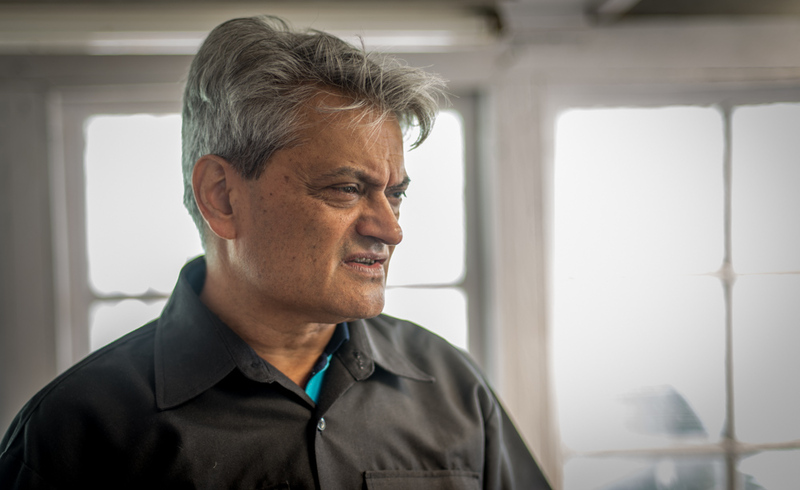 Mr Banerjee, the owner of Makaibari estate. 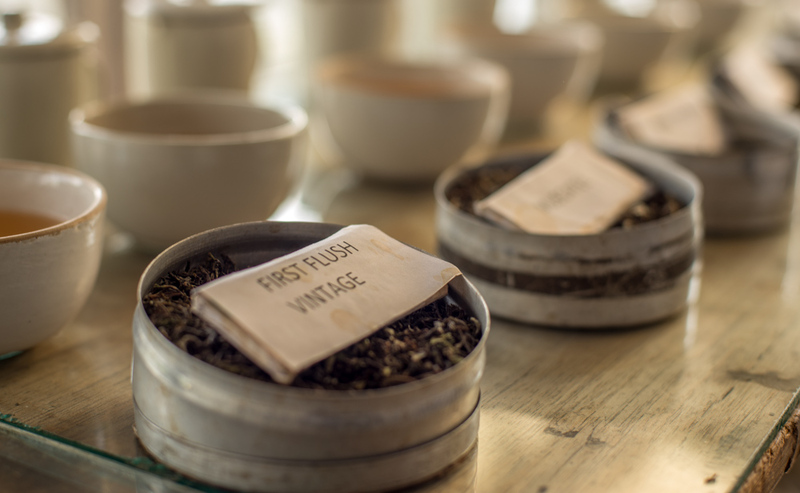 The tea tasting, at the end of the factory tour, was a ritualised affair with lots of gentle sipping of various teas, followed by spitting out the sample in to a sink. Similar to wine tasting, it seems that this is the correct way to taste tea. Or maybe it just adds some drama to the event! It's a wonderful experience and a fascinating insight in to an industry that is hundreds of years old. Little seems to have changed in that time. The area is also outstandingly beautiful and there is no better way to end the day than walking around the village and watching the sun set over the hills, followed by going home to a nice hot cup of sweet tea. Amazing sunsets are not rare but this one was particularly special. The makaibari home stay is fairly easy to reach. From Darjeeling take a share jeep that is going down to Siliguri and ask them to drop you at the factory. Make sure they don't drop you in Kurseong which is about 4kms short of where you need to be. Coming from Siliguri (or NJP) is a little more tricky as they might not want to take you or if they do, charge you the full rate for going to Darjeeling. Just insist and they will do it. The other option is private hire of a taxi which from either direction shouldn't cost much more than 500 rupees. For more info on the estate and the home stay you can check out their website here. 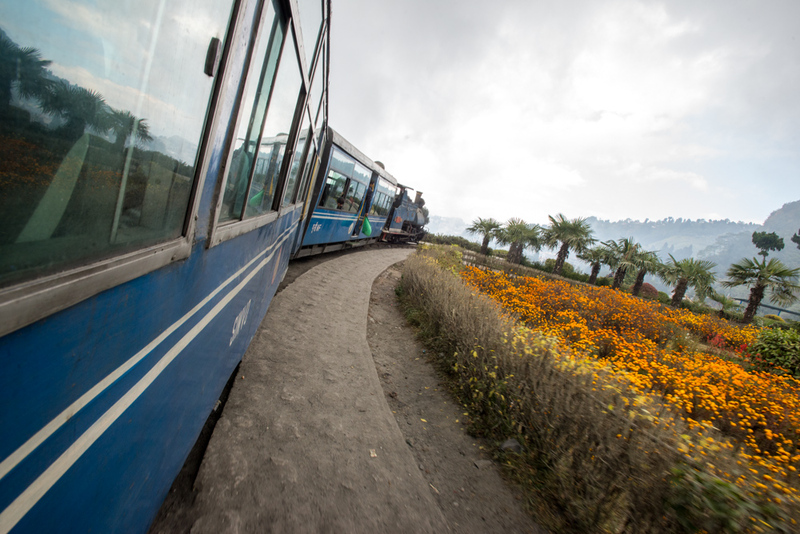 If you go, why not check out the Toy Train that runs from Darjeeling to Ghum. The unique experience of riding a victorian steam train winding along Hill Cart Road, sometimes just a few feet from buildings, cars and people is just about as much fun as you can cram in to one afternoon. Reputed to be the city with the longest continual history in the world, at over 3,000 years, Varanasi in India is like no other city on earth. The city is spread along the west bank of the Ganges River (or Ganga as it's known in India). Confusingly, the river, which flows from the Himalayas in the North to the ocean in the South East seems to be going the wrong way, so it appears that the sun rises on the wrong side of the river. This is due the fact that the Ganges makes a switch back in its course and flows North past Varanasi. Perhaps, this contributes to its holy mystic. The Ghats on the River Ganges at Varanasi. There are two points of interest in Varanasi to the visitor. First is the ancient, winding back streets of the old city. Often only wide enough for two people, they seem to bustle with people, motorbikes, cows, stalls, rickshaws and all manner of other 'chaos'. In a way that only Indians can manage, everyone (and everything) seems to always get to where it's going in the end. Here, you can find every type of produce on sale - flowers, spices, food, mobile phones, furniture, clothes and the most important of all, chai wallas. 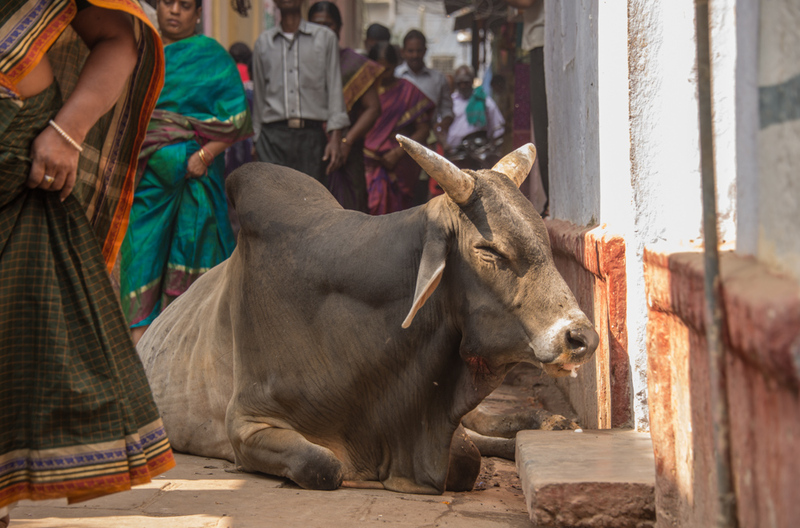 The narrow streets of Varanasi, complete with holy cow. The other area, and where it all happens, is the Ghats, which translates roughly as river bank. Depending on when you go, the ghats are either right on the edge of the river or 20 metres or so down steep steps. In the dry season, the river is considerably lower than during the monsoon season. Varanasi and River Ganges at dawn. The river is a holy revered place in Hindu culture and legend has it that taking a dip in the waters cleanses away sins and prevents the cycle of rebirth. It also has some significance for Buddhists and there is a large Muslim population. It's also a premier place for a funeral for Hindus and this is where cremations are carried out, on funeral pyres on the river bank, in public view. Photography of cremations is not appreciated and is considered disrepectful (understandably) so this is the only area of Ghat life that I didn't capture during my week in Varanasi. That said, you are welcome to sit and take in the ceremonies, if you are so inclined, and they are truly fascinating. There are many temples along the Ghats where devotees come, often also consulting with Sadhus, the mysterious monks who chant mantras, intervene in disputes and more. However, it is bathing in the Ganges that is at the heart of all worshipping. A worshipper bathing in the Ganges. The best time of day to experience the Ghats is at dawn, which is around 5am. The best views are from the river and it's easy to rent a space on a boat or even the whole boat. Prices vary depending on who you are, how busy they are, time of day, and your bargaining skills. We paid 400 rupees for 2 hours of slow rowing up and down the river. The experience was magical! Drifting along the Ganges at dawn. 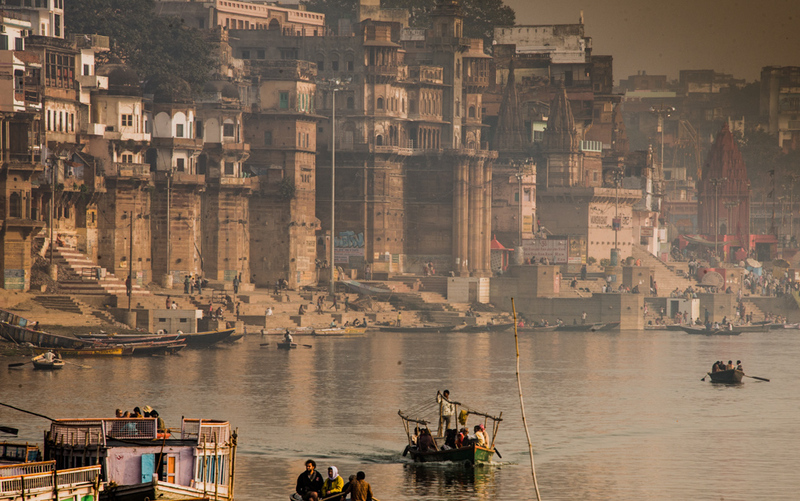 If you love people watching, and most do, then a day on the Ghats is like nothing else. Life, love, death and everything in-between plays out every day. For photographers, another major plus is that Indians, in general are not in the least bit camera shy. It's very rare for someone to refuse a polite request. Be prepared to do some modelling though. As much as they like be photographed they enjoy just as much taking snapping pics of you, and often as part of a big family group shot. Those that make living on the Ghats may ask for some coins for the privilege of making a photo of them but this is not unreasonable. The nightly show in Varanasi is performed by priests to a set routine. After your dawn river trip, a day people watching, lots of tea, maybe some samosas from a stall, an afternoon watching ceremonies and you still have some energy, you can watch the Ganga Arati. This is a ceremony that follows a set routine and involves music, chanting and various rituals. You can watch from on land or by boat from the river. No one minds if you sit right in the mix of it at the front either. It's very well done and popular with many Indian tourists that descend on Varanasi every day. A Sadhu meditating in a temple at dawn. This was built in to the river bank and not visible from land. Getting here is easy and information is widely available. Most foreign visitors either fly or take hte train from Delhi. It's also possible to rent a car from Delhi and have a driver take you. There are countless hotels and guest houses but be careful with some of the more budget ones with river views. They will be buried deep in the narrow streets and can be awkward to find. Andalusia, in Southern Spain, is spectacularly beautiful and an ideal destination for a keen photographer. 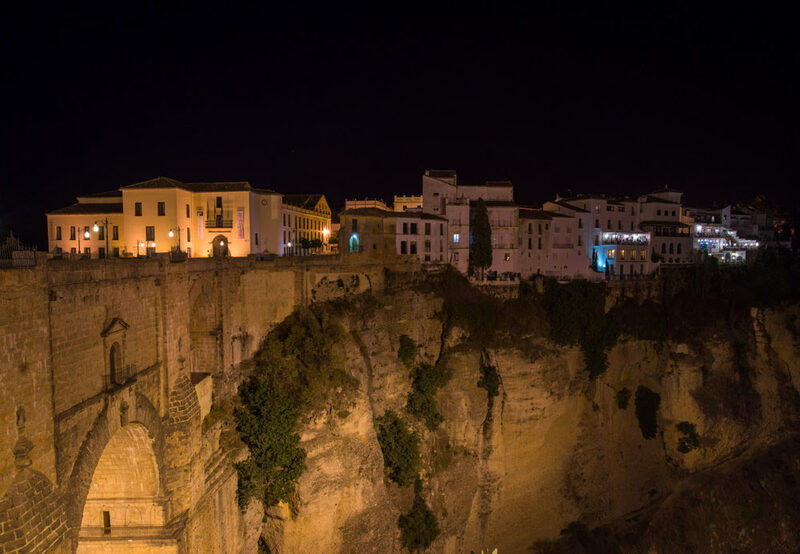 Ronda, in particular, is gorgeous and has everything from classic Spanish architecture, Moorish old city, landscapes, and photogenic people. The centre piece of the town is the New Bridge (El Puente Nuevo) which spans the El Tajo Gorge, linking new Ronda with the old citadel. The Bridge at Ronda, shot at dusk. On/Off resident Ernest Hemingway is thought to have based his book 'For Whom The Bell Tolls' on Ronda and the surrounding region. THe classic book is an account of the struggles during the Spanish civil war, and there is a passage in which Franco sympathisers met their end in the gorge. This closely correlates with actual events during the 60's when suspected fascists were thrown from the bridge. You can feel the drama and mystery in the rocks and stonework when you stand on the bridge. Before any of this happened, Ronda was an Arab stronghold during the Moorish occupation of southern Spain. The castle, streets, Arab bathes, and other key buildings are all still evident. I find it fascinating how the Spanish have built on and around the old Moorish architecture in a way that seems to compliment it. There is a certain harmony in the two, opposite styles. The building teeter on the edge of the gorge and almost look as if they are part of the landscape, rather than built on it. The great thing is that there are stunning views and landscapes visible from the town. You can face one way and shoot and city scape and then turn 180 degrees and shoot the sun setting over the hills on the horizon. 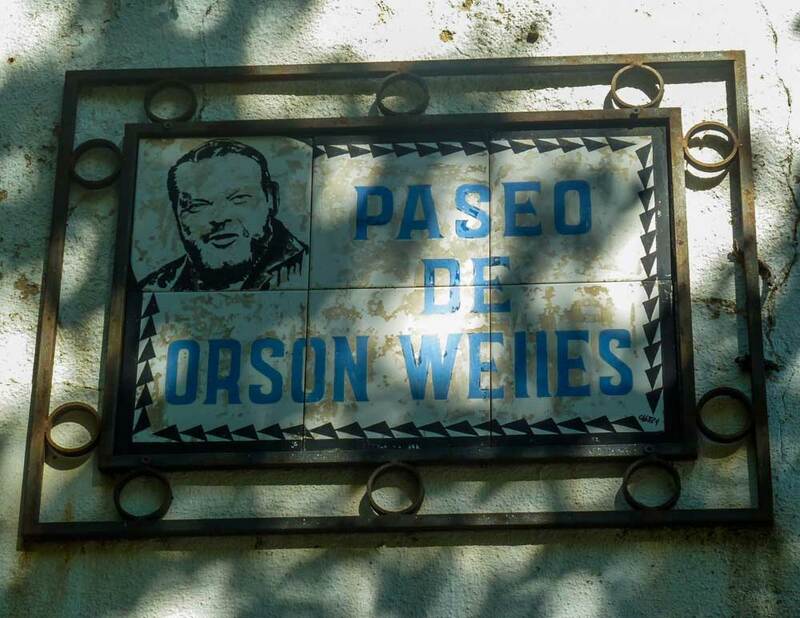 Orson Wells was another fan of Ronda, and often stayed there. Like Ernest Hemingway, they were drawn by the food, music, climate and colourful joy for life of the Spanish. There was another big draw, and that was bull fighting. Ronda is credited with being the birthplace of the modern bullfight. Although something of anathema to most foreigners, it was and still is, an integral part of Spanish life. The town centre is dominated by the Plaza de Torres , which was opened in 1785. The Plaza de Torres in Ronda. In bars and restaurants it's common to see old photos and drawings of the bullfighters and their famous guests. There are few events here nowadays but if you want to go, you have to book ahead. Photographically, the Plaza de Torres makes a great location for interesting compositions. Shot at dusk of the old town. A lookout over the valley from the vantage point in Ronda. 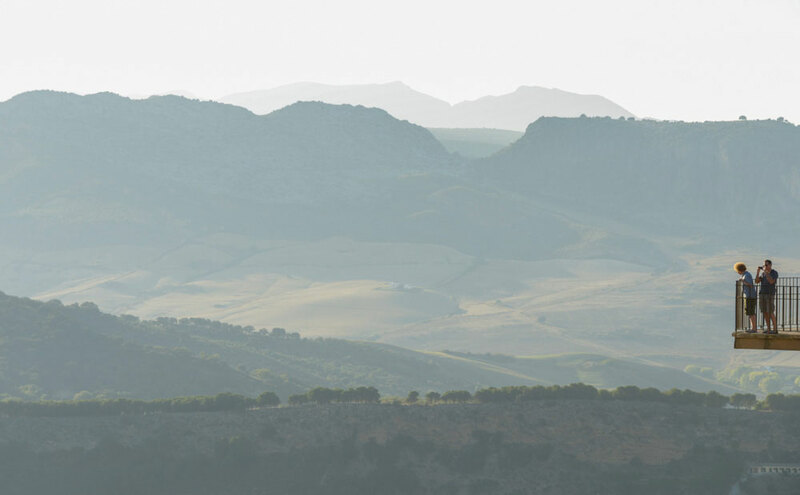 A few more shots from Ronda and the surrounding area to give you a taste of this Spanish gem.. Featured in the BBC Human Planet series, the living root bridges in North East India are truly spectacular. I found out about them after watching the series, which ran a segment on this phenomenon. The bridges are located in the East Khasi Hills area of Meghalaya state. Getting there is a bit of a mission but the journey is well worth it. Living Root Bridge in Mawlynnong, Meghalaya, India. There are two key locations to see the bridges, one is Mawlynnong and the other, Nongriat. Both of which are reached from Shillong. Besides the Living Root Bridges, there is also spectacular scenery and nature, great hiking, and of course the charming and friendly Khasi people. Also in the area is Cherrapunjee (or Sohra, as it's known locally), which is infamous as being the wettest place on earth. In fact, it is this massive rainfall that indirectly leads to the building of the root bridges. A local carrying wood across the bridge. They are not for show, they are an integral part of the 'highway' infrastructure. To get to this area you have to either fly, or take a train, to Guwahati. If you come by train, it's the end of the line. From the station you have to take a Sumo (the brand name of the Tata jeep), as they are called, to Shillong. This is a share jeep that takes 11 people. Sometimes more. They are easy to find and my method was to walk out of the station shouting "Shillong". Rest assured, the drivers will find you. It's about 4 hours to Shillong. Tip: If you have a choice, opt for a Mahindra jeep rather than a Tata, they seem to have more elbow room! From the airport it's a case of getting a share cab. This will be 3-4 people crammed in a car for the journey. Sumos costs 140 rupees and share cabs 300. Private hire is 1,500 rupees or more depending on your bargaining skills. Once in Shillong you need to head to Police Bazar which is the centre, and where most of the hotels are. Don't forget to go and see the archery shooting for the lottery draw during your stay in Shillong. Details here. Another bridge. This shot is only possible in the dry season. During the rains, this river is a raging torrent. To get to Mawlynnong, you have to take another share jeep. These are found at the sumo stand in Bara Bazar, which is about a 15min walk from Police Bazar. Locals will point you the right way. The sumos parks on the 2nd floor of the stand next to the jeeps for Sohra. It leaves at 1pm or when it's full, which in my case was at 3.30pm! The journey is about 3 hours. Once in the village, there are numerous home stays and guest houses. They are also building a new, large guesthouse, on the outskirts of town. This is to accommodate the ever increasing numbers of Indian tourists venturing in to the un-discovered world of the North East. Prices are relatively steep for the region. A single room is around 700 rupees and a double 1,200. A guide for the day (which is essential if you want to seek out other interesting sights in the area) runs at around 600 - 800 rupees for the day. Even without the root bridges, the whole area is unspoilt and spectacular. Mawlynnong (which claims to be the cleanest village in Asia) is charming and a great place to relax. 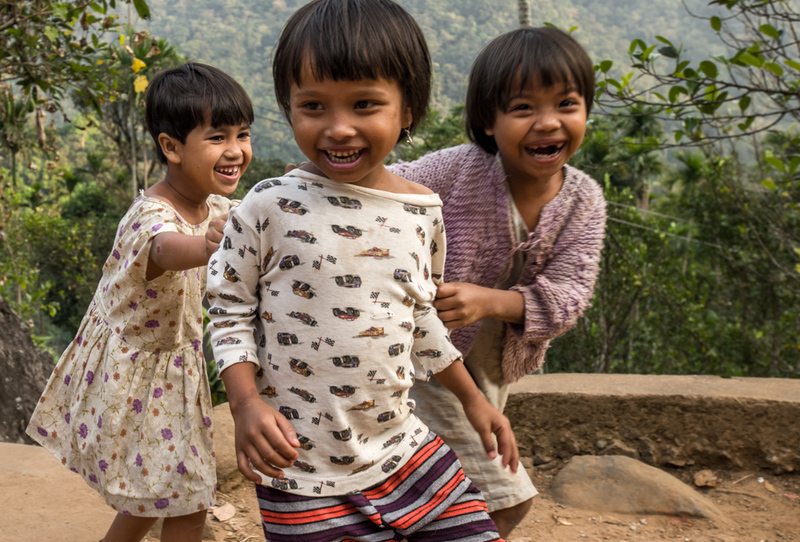 The local Khasi people, who are almost all Christian, are friendly and polite. It's a little surreal to wake up to the sound of a choir singing hymns, coming from the local Church and then in the evening. hear the unmistakable sound of a football match (which is well worth watching, the standard of play is very good). The Welsh missionaries did a good job here. To reach the nearest (and probably best looking) root bridge, you need to walk out of Mawlynnong back along the main road to the village of Riwai, which is a few kilometres. You will then see the sign to the bridge. A young Khasi girl selling fruit to the occasional visitors to the living root bridge. Ever smiling and good natured, you will be pleased to do business with her. Next on the agenda is a visit to Nongriat, which necessitates getting the sumo back to Shillong. It leaves at 6am most days and don't complain about being squashed in the back, there will likely be another six people hanging on the back outside, on what is, the only transport link back to town. You could go the same day or overnight in Shillong, and return back to the Sumo stand at Bara Bazar in the morning, and taking a jeep to Sohra. These are much more frequent and the journey is shorter but be careful on the return, the last jeep leaves Sohra just before dark, at around 4.30pm. Sohra (or Cherapunjee) is the town that is in the Guinness Book of Records as being the wettest place on earth. It was brilliant sunshine when I was there so I'll take their word for it, but I was there in the dry season! To get to Nongriat you have two main options. Noh-Kalikai Falls which during the monsoon season, are the primary feed of huge volumes of water to the Nongriat valley. The choices depend on how intrepid you are: The first is to hire a taxi from the stand in Sohra and ask him to take you to Tyrna. This will cost around 100 rupees and takes 15 mins. From the drop off point, which is the end of the road, just follow the hand made sign to 'Living Root Bridge' and off you go, walking down a couple of thousand steps and pass through Umsohphie village. Bear in mind, if you return this way, you'll need to get the drivers phone number so that he can come back and collect you. Otherwise you might have a very long wait for a car to turn up. The other option, is to get a taxi to take you to the falls look out point, where there is a few local shops, a viewing platform and a some other buildings. Once here, walk along the cliff top back towards Sohra until you reach the end of the barbed wire fencing that is sort of half up along the ridge. Look carefully for a pathway. They are little used now and not maintained so overgrow quickly. It's just a track at the top but will quickly turn in to path of stone steps. Then just keep heading downwards. It's a long and tough hike (especially carrying camera kit in a backpack.) You can't really get lost. As long as you are on a path and heading down, you are going to reach Nongriat. Coming back this way is a quite a haul from the valley floor to the top. The famous double decker root bridge. This is where you will find the famous double decker root bridge. There is a guest house in the village, which costs 2-300 rupees per night. An enterprising villager called Byron is building a new one (Nov 2012), which should be open by the spring of 2013. He and his wife Violet, run the village shop and he is also a good guide. The people in the village are lovely and there is great hiking to be done in the local area, including some caves, which I didn't visit. Try and find some locals collecting honey, and see if you can buy some from them (the ladies I came across, wouldn't take any money for letting me try some). Pure honey is wonderful and if you have the dreaded Delhi cough, it will work wonders. Unlike Mawlynnong, there are very few Indian tourists visiting Nongriat at the moment. They tend to prefer not to do long arduous walks. However, there is talk of extending the road deeper in to the valley, which will surely open Nongriat up more. The roots of the tree are 'trained' to grow in a specific way to form the structure of the bridge. The bridges are formed from the roots of the Indian rubber tree, which naturally grows along the banks of the rivers, its roots snaking all over the rocks to reach water during the dry season. These trees also naturally 'pair up', intertwining with the roots of other trees to share resources. The locals realised that with careful coaxing over many years the roots could made to form almost any shape. There are even living root bridge step ladders. It takes decades to build a bridge but once complete, they just get stronger over time. It's said, the bridges can last up to 500 years. The East Khasi Hills, are very close to Bangladesh and I'm sure there is much more to dicscover in this region. 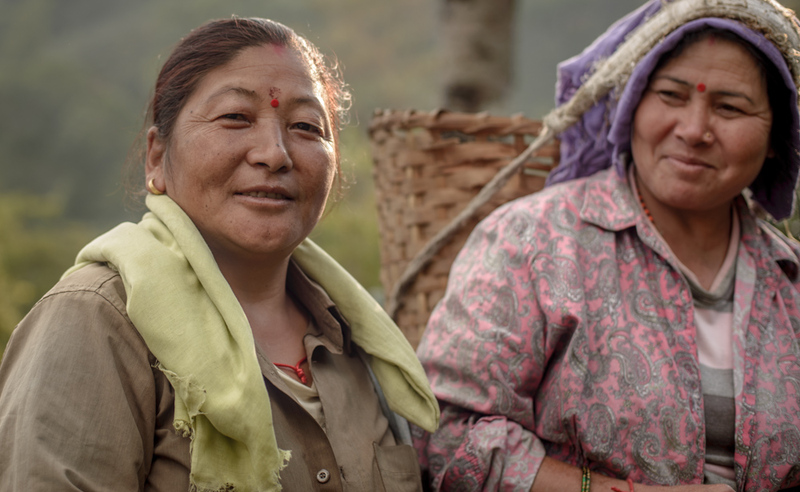 The matrilineal society of the Khasi tribe is interesting in that family property is inherited through the mothers side.